The Dan River in Danville,Virginia crest at 25.3 ft. in the early hours of Wednesday Morning. This was the 3rd highest crest in the past 20 years. 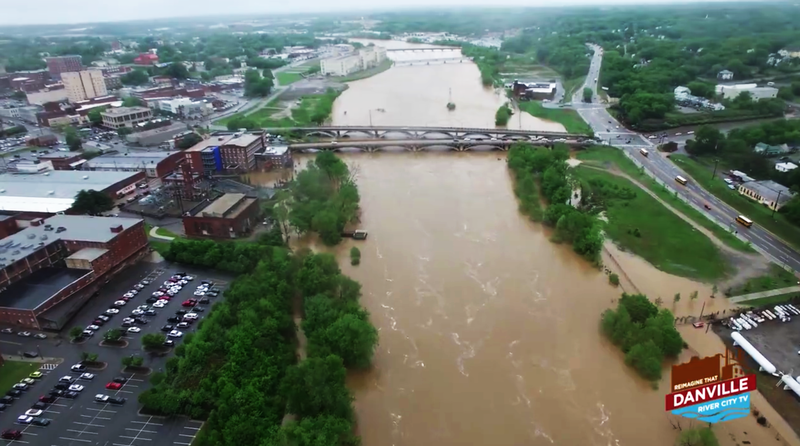 We captured a few spots from the air on Tuesday Afternoon where the mighty Dan spilled its banks. Community gardens have sprouted throughout the city and more could be on the way. There are about a dozen in the city, according to a master garden list from Danville Housing and Development Planning Specialist Jackie Wells. A lot of cities, including Danville, are looking to revitalize themselves and have more vacant land to grow food, said Annie Martinie, senior program officer with the Danville Regional Foundation. The DRF has provided grants for groups to start community gardens in the city, and is talking to people who want to start others, Martinie said. “It’s picking up,” she said. The DRF provided a $10,000 Make It Happen grant for the Community Market’s garden in 2011. It also provided $10,000 for Camp Grove Baptist Church and about $2,000 for Moffett Memorial Baptist Church to start gardens. There also was a $17,598 investment for a garden under Grace and Main Fellowship in February 2016, Martinie said. There are more likely to come, Martinie said. Community gardens are part of a local food trend in which people know where their food comes from and they want it free of pesticides and chemicals, Martinie said. Also, they enable community members to come together to grow food and eat healthier, she said. “People who live close to community gardens and participate in community gardening eat more fruits and vegetables,” Martinie said. The garden at the Community Market on Craghead Street has 15 plots, and provides residents the opportunity to plant their own produce, get in touch with nature and teach their children about gardening, said Kenny Porzio, program coordinator with the Crossing at the Dan. “Most of them live in the River District,” Porzio said. It’s convenient for them to walk over, plant, harvest, and go back to their apartments, he said. Tomatoes and greens are the primary crops, Porzio said. Danville Parks and Recreation funds the garden, maintains it and helps clean it up. Porzio oversees the administration of the plots. The garden started in 2011 and has an application process every March for those interested. Applicants are selected through a lottery system and assigned plots, Porzio said. Like farmers markets, community gardens let residents get fresh local food and know where it’s coming from, Porzio said. Grace and Main Urban Farm — under Grace and Main Fellowship — has at least 20 beds for people to grow food at Moffett Street. Habitat for Humanity donated the land to the fellowship in 2014. About 60 percent of space is reserved for the community to grow food — including that for the 70 community meals a year the fellowship hosts — or to be given away to the needy, said Joshua Hearne, director of Grace and Main Fellowship. The other 40 percent is for those who have their own small gardens, Hearne said. Everything is chemical-free, sustainable and inexpensive, he said. “They can come and garden with us for a few seasons and if they’re ready to start their own gardens elsewhere, we’ll help them out,” Hearne said. The space at Grace and Main Urban Farm is about 1.4 acres, with food grown on about 3/4 of an acre, he said. The farm has fruit trees and herbs and grows a plethora of vegetables including tomatoes, squash, zucchini, peppers, cucumber, watermelons, onions, potatoes, carrots, turnips, beets, green beans, October beans and a variety of greens. A leadership team oversees the gardens — some have gardening and farming experience and others have overcome homelessness, Hearne said. The organization works with those experiencing poverty, addiction, hunger, homelessness and other injustices, he said. The idea for the urban farm started after the fellowship planted six gardens for individuals in the north part of the city. Those gardens were the seed for the urban farm, Hearne said. Danville Parks and Recreation oversees community gardens at Coates and Stonewall recreation centers. Coates has three raised beds, and Stonewall has two. Last summer, they grew basil, parsley, tomatoes, squash and zucchini, said Health and Wellness Program Coordinator Danielle Montague. Parks and recreation provides parents with produce and recipes and teaches the children how to cook with the vegetables, Montague said. “Sometimes, they will even come up with their own recipes,” she said. Arugula and bok choy are being grown, as well as more fruit including strawberries, cantaloupe, watermelon, and blueberries, she said. Wells started and oversees the city’s Lots of Potential community garden program, which works to change vacant and under-used, city-owned property into sites for food production. The program connects churches and organizations with available plots of land they can apply for. Some of the vacant lots in the city may not be ideal for development, so they could be used temporarily for gardening until a developer comes along to buy the property, Wells said. “If there is an interested developer wanting to build homes or apartments on those lots, they would still be able to do that, but in the meantime, why not have some useful purpose for the land?” Wells said. The gardens would be removed if a developer decides to build on the property, she said. Another community garden could be coming to the corner of Worsham and Wagner streets. The Rev. Tommy Crews, of Right Touch Christian Church, plans to operate a community garden in partnership with the Lots of Potential program. The Danville Planning Commission voted April 10 to recommend that City Council approve the plans. Crews told commissioners during the meeting the garden would be not only for the church, but for the community at large. It would include fruits and vegetables, he said. The garden would be on two parcels totaling about a half-acre at Worsham and Wagner streets. Useable garden space would be about 450 square feet. Right Touch Christian Church would license the parcels from the city for up to a year, renewable at the end of each term. It would increase “access to fresh foods in an area where there are few health food options for residents,” Wells said. “There is increased awareness of what are commonly called ‘food deserts’ — or areas where nutritious food is difficult to obtain due to availability, distance, affordability or some other factor and the effect that these areas have on low- and moderate-income families, including increased health risks,” Wells said during an interview earlier this month. Community gardens are one way to tackle that issue, she said. “I’m excited that this local food movement is really taking off and people are interested in growing their own food,” Martinie said. 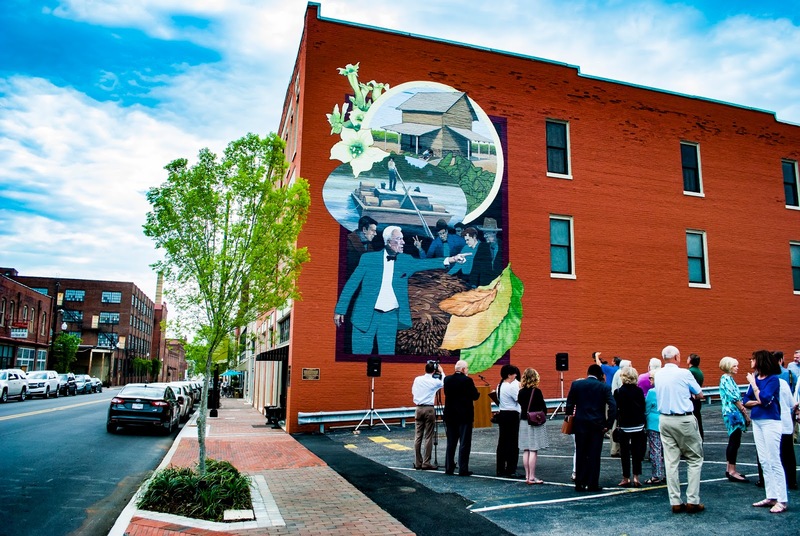 A mural highlighting Danville’s tobacco history was dedicated in the River District on Friday morning. 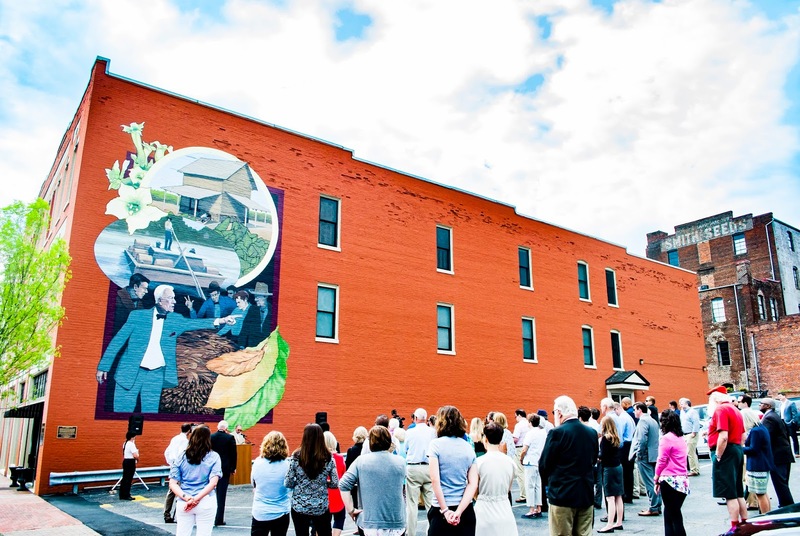 The 20-by-30-foot Tobacco Heritage Mural was painted in December on the side of 308 Craghead St. that faces Patton Street and is visible from the River District’s busiest intersection at Main and Craghead streets. Community leaders, city officials and those active in historic preservation attended the dedication held in front of the mural painted by artist Wes Hardin, who also painted the transportation and Wreck of the Old 97 murals in the River District. 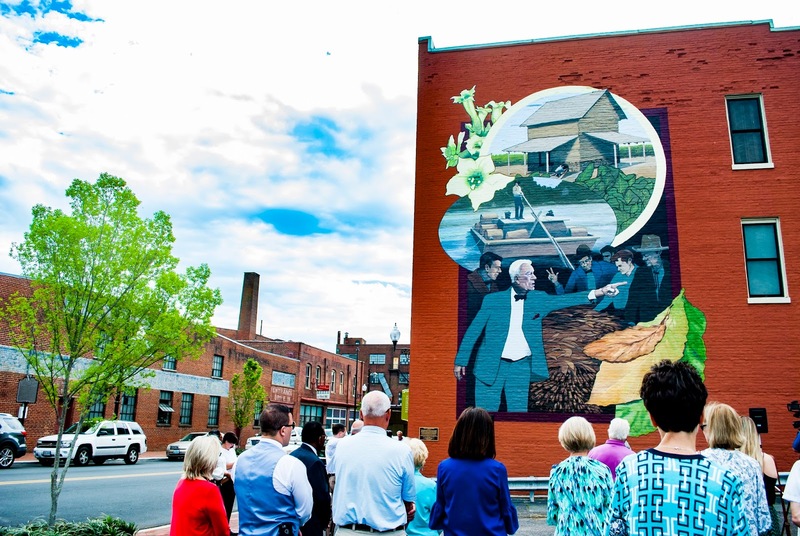 The mural is the third commissioned by the River District Association, which raised $20,000 over several years for the artwork. Jerry Amburn, River District Association board member and chairman of its mural committee, said the group has worked to implement the mural program to showcase the city’s heritage through historic public art. JTI Leaf Services and others donated money and contributed to the project. Preservation Virginia Field Representative Sonja Ingram praised the rendering of the tobacco barn image in the mural and connected it to Preservation Virginia’s tobacco barns preservation project, which will have repaired more than 60 barns in the Dan River Region by the end of 2018. JTI has been funding the project. 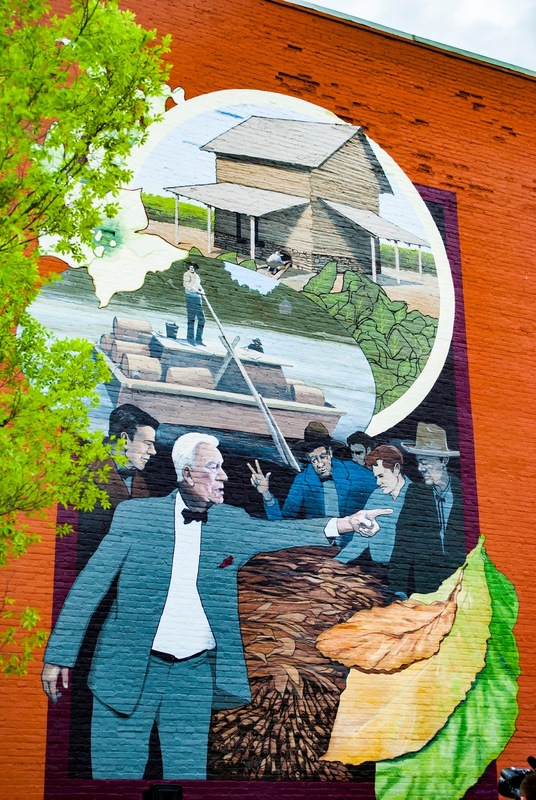 William Gentry Jr., whose father William Gentry Sr. is depicted in the mural as a tobacco auctioneer, owns the building at 308 Craghead St. and gave the association permission to use the side of the structure for the project. The building houses Gentry Lofts and offices that face Craghead Street. The mural includes a flue-cured tobacco barn at the top, a man in a bateau transporting tobacco and a tobacco auction featuring William Gentry Sr. as the auctioneer. “I appreciate my Dad letting me put his face up here,” William Gentry Jr. said. The tobacco industry has changed over the years and the auction system no longer exists, but U.S. tobacco – especially tobacco from the region including Danville and Southside Virginia – is the best-flavored tobacco in the world, Daniels said. “Tobacco put Danville on the map, and it served as an economic catalyst for our city,” Gilstrap said. Billy Yeargin Jr., a tobacco historian, pointed to tobacco’s role in Virginia since the early 17th century, when John Rolfe introduced it as a commercial crop. 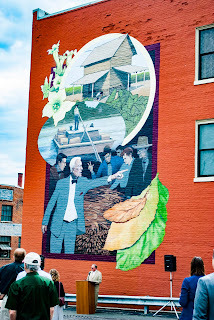 Ernecia Coles, executive director of the River District Association, said the mural is something people can connect with. “We’re hoping this will be part of people’s visits downtown,” Coles said. The association’s next mural will honor Wendell Scott, the Danville native who became the first African-American NASCAR racecar driver. For Emily Ragsdale, the Virginia Tech shootings are hard to talk about. The 2010 VT graduate was in her dorm when the tragedy happened 10 years ago. Ragsdale, then a freshman majoring in public and urban affairs, had just left her 8 a.m. class, near where the shootings occurred. “It was a terrible tragedy and it was really hard on everyone,” said Ragsdale, facilities and services planner with Danville Parks and Recreation. Seung-Hui Cho killed 32 students and faculty members on the Virginia Tech campus in Blacksburg before taking his own life on April 16, 2007. He was a senior, majoring in English. The horrific event brought the entire Hokie Nation together, Ragsdale said. Local officials and Virginia Tech alumni and fans gathered at the JTI Fountain Monday morning for a public remembrance service for the victims of the shootings. About 50 to 60 people attended the event – most dressed in the school’s colors of burnt orange and Chicago maroon. Pat Daniel, who graduated in 1979, organized the ceremony after Virginia Tech President Timothy Sands asked that victims be commemorated. Daniel pointed out the school’s motto, Ut Prosim, meaning “that I may serve,” and said she hopes to have commemorations in the future. Del. Danny Marshall, R-Danville, spoke during the ceremony, reading part of poet Nikki Giovanni’s “We are Virginia Tech” convocation address from April 17, 2007, and urging everyone to keep those affected by the tragedy in their prayers. Danville Mayor John Gilstrap said he remembered where he was when it happened. The incident didn’t occur at a campus in a city in another part of the country, he pointed out. “This tragedy took place in our own backyard – on the grounds of the Hokie Nation campus,” he said. The lives taken that day were those of students and faculty who – as Pat Daniel said – “were at the top of their game,” Gilstrap said. “They personified great promise and great accomplishment,” Gilstrap said. Chatham businessman Ben Davenport Jr., a 1964 VT graduate, recalled that he was serving on the university’s Board of Visitors when the shootings happened. He received a call from his wife telling him about the incident. “I got in my car and drove to Blacksburg,” Davenport said. Kenny Lewis, who played football for Virginia Tech and the New York Jets, gave the prayer during the ceremony. His son was attending VT at the time and was in a building next to where shootings took place, Lewis said. His son had no idea what was going on, he said. Virginia Tech alumni Chuck Vipperman and Fred Shanks read the names of the 32 victims — all “wonderful souls,” Vipperman said. He encouraged attendees to go online and learn about them. The event included the ringing of a small brass bell 32 times and a balloon release. Shanks, a city councilman and a 1982 Virginia Tech graduate, told the Danville Register & Bee after the event he had studied hydraulic engineering under one of the professors killed in the shootings – G.V. Loganathan, a civil and environmental engineering professor. “He was a young and energetic professor when I was in school,” Shanks said, adding he was stunned when he heard about the shootings and Loganathan’s death. The tragedy was especially emotional for Shanks, who grew up visiting Blacksburg because his father was from there. “It [the shootings] was one of those moments like 9/11 where everybody knows where they were and what they were doing,” Shanks said. The Launch Place is investing $250,000 in a company that enables doctors to record patient encounters using an app and have the medical information documented and entered into their medical records by remote writers. Representatives with Durham, North Carolina-based iScribes and The Launch Place announced the investment Friday morning at Spectrum Medical in River District Tower. The money is to further iScribes’ operation capacity and technology for delivering its virtual services, said Jimmy McGarry, who serves on the board of directors for The Launch Place. “It’s an investment, which means we have confidence in their company,” McGarry said during the announcement. Community leaders attended the event, including city officials and Delegate Danny Marshall, R-Danville. iScribes, which started in 2014, has 27 employees in Virginia and is in eight states, said CEO and founder Dr. Jared Pelo. He hopes to hire scribes in the Dan River Region who would work from home. “I plan on bringing lots of jobs to the region,” Pelo told the Register & Bee. Christopher McGuire is the co-founder and head of sales at iScribes. The company will have a satellite office at The Launch Place, Pelo said. With iScribes, health care providers record patient encounters using the mobile app, and remote, virtual writers listen to the interaction, write medical documentation and enter it into electronic medical records for the providers. It saves physicians hundreds of hours per year of clerical work, according to Pelo. Doctors spend 40 percent of their time documenting patient visits in electronic medical records, decreasing available time for patient care, Pelo said. The use of medical records has been an important step in the modernization of health care, but it has posed challenges for providers. It has also affected the doctor-patient relationship, with some physicians conducting exams facing a computer instead of their patients. 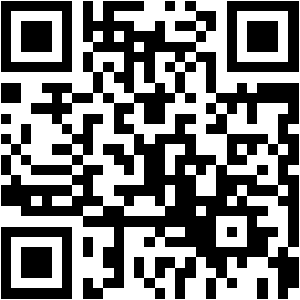 No dictation is required and the scribes complete documentation directly in the provider’s electronic medical records. Two physicians at Spectrum Medical use iScribes, Pelo said during the announcement. Dr. Jonathan Krome at Spectrum Medical also uses iScribes, Pelo said. iScribes has continued to grow since it began in March 2014, Pelo said. “It’s exciting even to be in this building today,” McGuire said, referring to the new River District Tower. The Launch Place led the investment deal in which Triangle Angel Partners II, LLC (TAP II), an angel investment fund in the Research Triangle Park, North Carolina, co-invested for a total of $410,000. iScribes is the 12th investment for The Launch Place, totaling $2.25 million. As for providing jobs, Pelo said the company is hiring. A medical background is not needed for positions, he said. Applicants must be hard workers and decent writers, Pelo said. Those interested can apply online at iscribes.co. The Launch Place, from a $10 million grant received from the Danville Regional Foundation in 2012, helps with entrepreneurship and business development, and job creation and retention through its business consulting, mentoring and training, residential and office subsidies, and two seed investment funds in the Dan River Region.